Ideal riding territory, the central mountains or sierra of Argentina are beautifully rolling, with lush fields and incredible scenery unspoilt by buildings or people, save the cattle-herders and gauchos. Rides can range from a couple of hours to several days' riding and camping on long distance trails. Estancia Los Potreros has a riding herd of over 80 incredibly responsive and reliable horses, mainly bred on the estancia, ideal for beginners to experts. The varied work that they take part in including rounding up cattle, taking out guests or playing polo, combined with the natural lifestyle they lead in an un-stabled herd environment means the horses are always fresh, interested and keen to do their jobs. The herd is a mixture of Criollos, polo ponies and some crossbreeds. In addition, the estancia breeds Paso Peruanos, a unique horse that has five gaits or paces (instead of four) which provides an extremely comfortable riding experience. In addition, while at Los Potreros, guests are encouraged to get involved with all of the horse activities on the farm, whether watching the horse-breaker at work or rounding up the mares and foals to protect them from pumas. At El Colibri, where horses are an equal passion, polo is the order of the day. The ranch has its own polo fields and offers tailor-made polo clinics with the in-house professional, who also puts on practice games and tournaments, dependent on your ability. 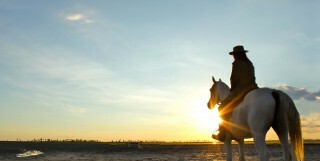 Not just a riding experience, but a chance to sample the life of real South American 'cowboy'. Ollie and Kate B are our 'Riding & Polo' experts and as seasoned travellers they have the inside track on the most memorable adventures.